You’re running ad campaigns and spending marketing dollars. But, do you know what your marketing goal is? What does success look like for your business? Depending on who you ask, you’ll get a variety of answers to this question. You might be told success is measured in Facebook followers, likes on a post, or increased web traffic. You might be told success comes in email open rates or online video views. While all of these are a benefit to you, success ultimately comes with increased sales and business growth. 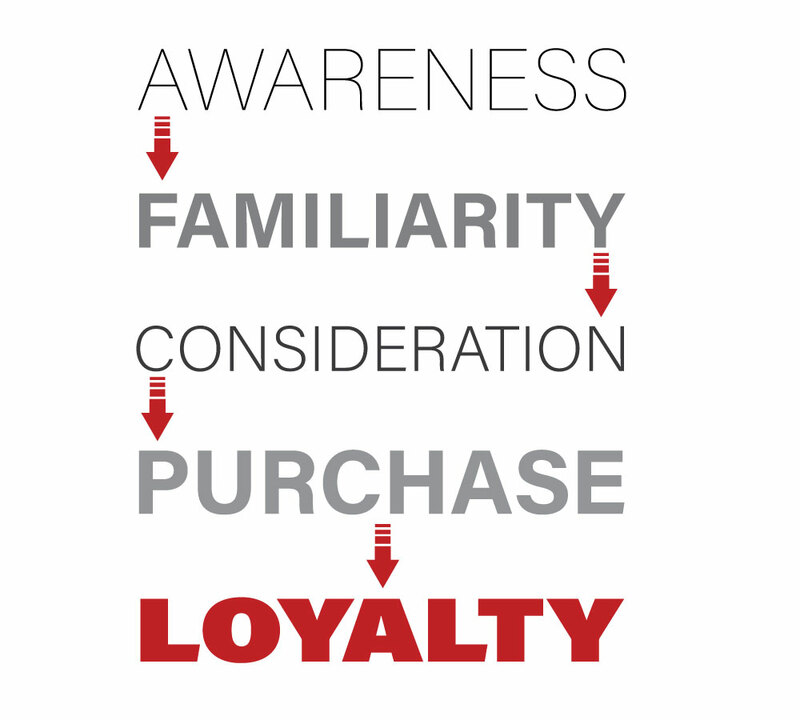 Sales start with a potential customer and his or her journey through the purchase funnel, outlined below. A business needs to implement different strategies to successfully have a consumer complete each stage. Each stage has a different measure of success. In the Awareness stage, simply getting your business name out to the masses is the goal. It’s simply that – making potential customers aware of your business. Familiarity is the stage where a consumer is aware of your product or business and may have an intent to purchase. Once at the Consideration stage, the intent to purchase is there, but the consumer may be doing research or asking others’ opinions. The length of time in this stage can vary based on the value of the product. The Purchase stage is the stage you have been working toward! Your potential customer is now your customer. This brings us to the last stage, the Loyalty stage. You want a customer to be a brand ambassador, sharing their opinion with others. Of course, you want this to be a favorable opinion. A lot can go wrong as a consumer moves through the purchase funnel. At any point along the way, a consumer may drop out of your funnel and not finish the purchasing journey. Your competition will do its best to make that happen. To deter consumers from exiting your funnel and keep them moving forward, it’s crucial to strategically align your marketing campaign. Did you get the customer to call your store or print a coupon? Great. Did they go to your site and put a product in your online shopping cart? Even better. But until that potential customer has checked out, they are not yet a customer. To be a success, your marketing plan must first create opportunity, and then convert that opportunity into a sale. If you feel you are not seeing the success you’d like, or if it seems like your marketing dollars are not being spent to create these kind of sales opportunities, contact us and we’ll discuss what success could look like for your business.